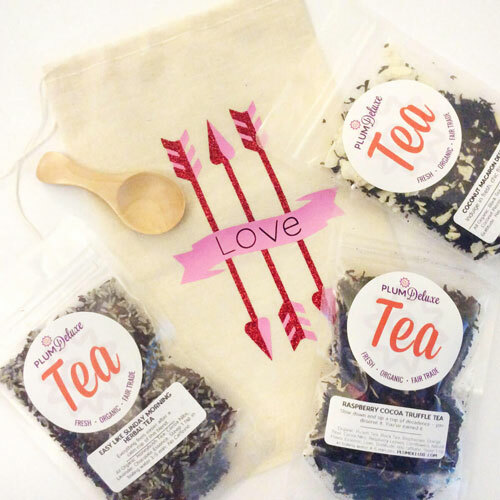 If you are a tea lover around the holiday season, go the extra mile for your Christmas get-together this year and style it like a winter tea party. We have a multitude of recipes to fill your Christmas tea menu and keep your party merry. First up on your Christmas tea menu are small snacks to whet guests’ appetites. This is a tea party, after all, so dress up your appetizers with finger sandwiches. Get inspired with these three new takes on traditional tea sandwiches like fig, honey, and bleu cheese, or make use of the seasonal fruits with this Apple Slaw Sandwich. 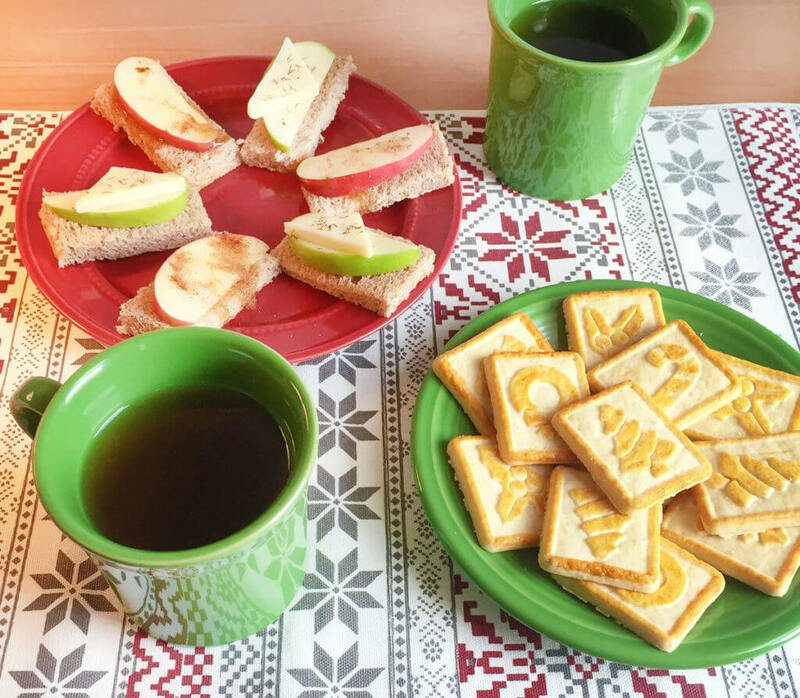 Classic tea sandwiches with fruits and cheese never go out of style. If you feel like there is too much bread in a tea sandwich, swap out the bread for a different starch like these Apple and Bleu Cheese Sweet Potato Bites. 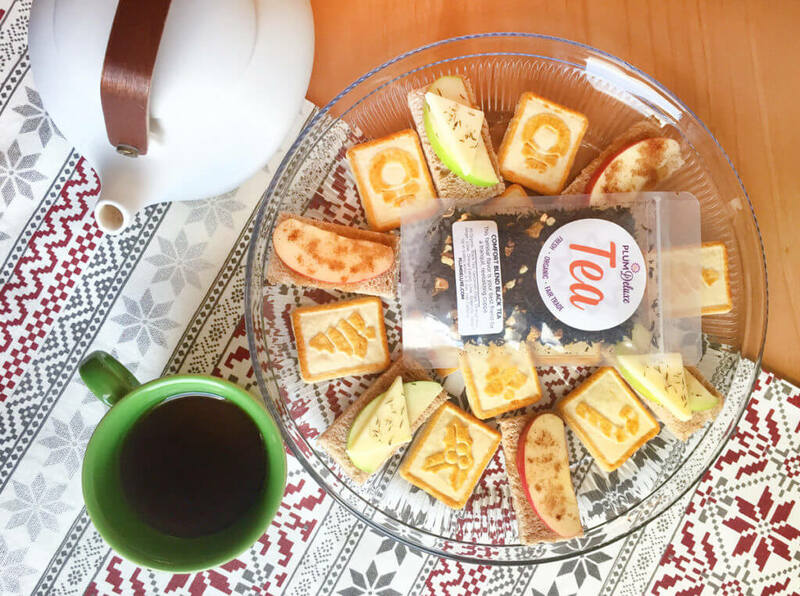 For appetizer tea offerings, brew something light and fruity like Lemon Creme Earl Grey or the peach-pear white tea blend of Afternoon High Tea. 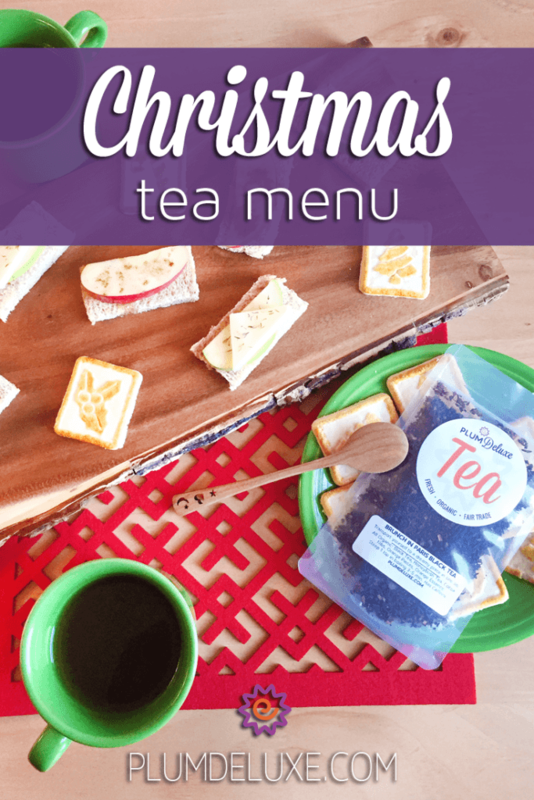 Fill out your Christmas tea menu with something rich and savory, perfect for cold winter nights. These Spinach and Artichoke Dip Bites are a delightful finger food to serve alongside your tea sandwiches for easy snacking. Or show off some winter vegetables in this tasty and texture-rich Warming Winter Wild Rice and Lentil Salad. For food that will help stick to your ribs, explore hearty soups. Impress your tea-loving friends with the unusual Chamomile Corn Chowder. Or be bold with any one of these three unusual root vegetable soups, suitable both as a dish and a conversation starter (“So what is celeriac?”). If you aren’t sure how to serve soup in a tea party setting, consider portioning out the soup in decorative shot glasses and call them chowder shooters. As one more savory suggestion, serve quiche from a pretty pie plate, or make mini quiche bites to satisfy your guests. 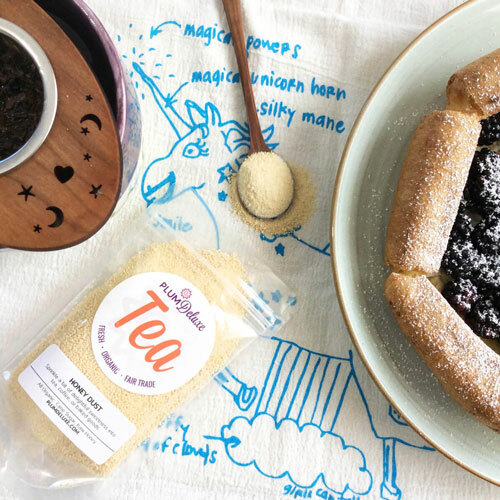 Try an easy crustless Smoky Sausage Quiche or a Cheddar Corn Faux Quiche to round out your Christmas tea menu. 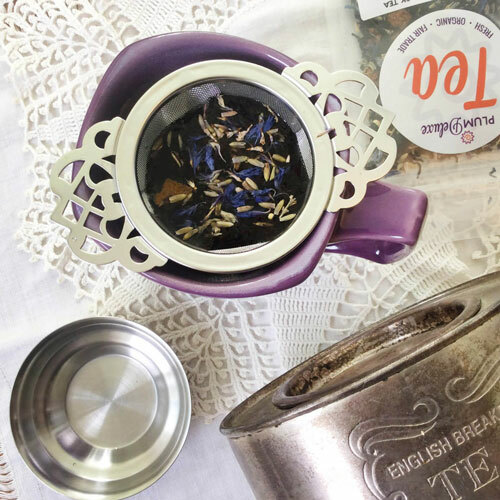 For teas that compliment the main course, brew a robust black tea like the lemon-crisp Fog Cutter or the flavorful but caffeine-free No Obligations. It wouldn’t be the holidays without extra desserts. Sweet additions are always welcome, especially on a Christmas tea menu. Feel free to have smaller sweets like chocolate bark or dairy-free chocolate truffles available throughout the day, alongside other finger food, and save something big for a grand finale dessert. 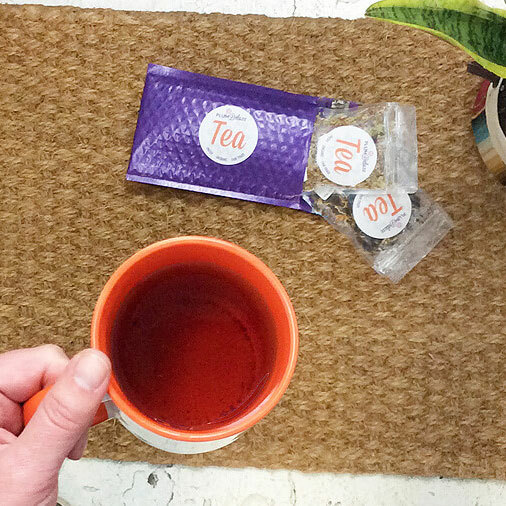 Tea cookies with icing are great for any occasion. The best part about icing is that you can make it any color or pattern you like, so feel free to get festive with wintry stars and swirls. Just imagine that the round cookies are the Christmas ornaments on your tree and let your inner-artist run wild. Likewise, Crunchy Cocoa Cookies look appropriately snow-dusted with their coat of powdered sugar. I mentioned a grand finale dessert if you are looking for the proverbial star on your tree. Nothing says the holidays like a Yule Log Cake; decorate it as complex or simple as you like — it will taste delicious either way. Other great grand finale choices would be The Best Apple Crisp in the World or a gingerbread coffee cake. Balance out the sweetness of dessert with a bright and celebratory tea like Candlelight White Tea with flavors of champagne and citrus, or have a relaxing digestive herbal like Refreshing After Dinner Mint to evoke the idea of smooth peppermint candy canes. With dozens of holiday recipe ideas, you can make your Christmas tea menu as lavish or as simple as you prefer. No matter how you conduct the tea party, the flavors will be delicious and the spirit will be merry and bright.